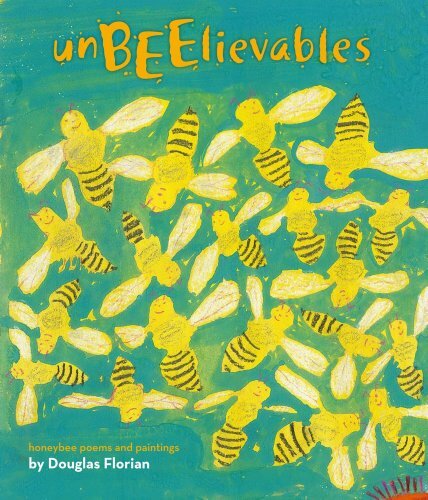 A lovely review of UnBEElievables was posted today on the blog of the Eric Carle Museum of Picture Book Art. I really think the reviewer "got" the idea of the book: Learn while you laugh, and look while you learn. 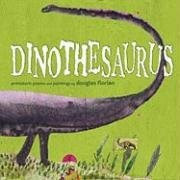 This volume contains poems that often burst with humor, puns, alliteration, and rhyme. Each poem is accompanied by a nugget of scientific fact and faces a page of bees with attitude, sometimes wearing fancy hats or jewelry. Many poems feature different bees, including queens, workers, scouts, and drones. 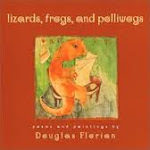 Other poems focus on life cycles, pollination, the recent disappearance of bees, and beekeepers. 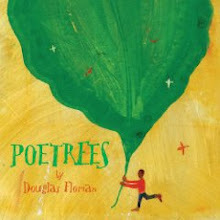 We learn a lot, and with pleasure in the inventive language and simple, funny paintings with lots of green and gold, which are sometimes amid collage and rubber stamp work. Further reading is suggested at the end, along with a BEEbliography. I will be running out to buy this book so that I can devour it! In fact I probably need to get 2. One for my sister who is bee crazy and another for myself. I'm experimenting with collage, different papers, paint...trying to teach myself and I need this book to stare at for hours on end. Thanx so much Cynthia! Good luck with your collages and paintings. keep me posted! Any buzz about a show at the Eric Carle? That would B wonderful and B utiful.